The introduction of flexible EPDM (Ethylene Propylene Diene Monomer) sheeting has greatly improved pond-building techniques. The great strength pond liners provides an extremely durable construction material while its elasticity allows a stretch-ability. This stretch-ability allows the liner to stretch (rather than crack as cement ponds often do) with earth movements or ice pressure. These liners should not be confused with polyethylene, as EPDM is a vastly superior synthetic rubber product. It is comparable in durability and length of life to concrete construction. 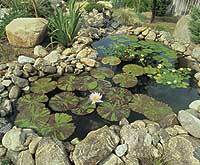 PREPARATION - Ponds can be constructed in-ground or above ground using the pond liner method. For in-ground ponds, dig the excavation at least 18 inches deep with straight sides and a floor with a 2% slope. At the lower end of the 2% slope, dig out a hole 36" in diameter and sloping to 1 ft. This hole helps to easily drain and clean the pond. Be sure the pond rim is absolutely level from side to side and end to end. If it is not level, the liner will show on the high side. Remove any sharp rocks. It is a good idea to line the excavation with damp newspapers, building felt or discarded carpet padding for additional protection. You can build the frame for above-ground pools with blocks, bricks or railroad ties, etc. Build to the desired dimensions with a height of 18 to 24 inches. Make sure the rim of the frame is level on all sides. Line the inside of the frame as described above if rough or sharp edges are present. INSTALLATION - The liner will be more flexible if allowed to warm in the sun. Spread the liner tautly and evenly over the pond excavation or frame, being sure that it is centered with an equal amount of overlap on all sides. If needed, anchor the liner with small weights on the outer edges. Place garden hose in center and begin to run water onto it. The weight of the water will begin to pull the liner down, stretching and folding it to the contours of the pond. For sharp angles, you may need to make a smooth fold into the corners as the pond fills. After the pond is full, allow to settle for one day, then drain if you are going to cover the liner with cement (note it is not necessary to cover today's EPDM liners with cement unless you want the look of a cement pond). On the top and 5 inches back from the edge of the pond, drive in 8 to 12 inch spikes every 12 to 18 inches to hold the liner in place. Then, if and only if, you are going to cover your liner with cement, get 24" wide chicken wire and hook one side on the spikes and run the other side to the bottom of the pond. Use the chicken wire as a structure for the cement. After the cement hardens (approximately 12 hours) rinse with soap and water, then refill pond. We do not recommend building ponds with planting shelves in the hot Southwestern U.S.